The 2015 New Zealand print project continues with one of my favourite photographs from our trip. This composition was taken at one of the nicest stops on our journey - Muriwai Beach. After a couple of rainy days, we spent three sunny spring days at Muriwai, on a beautiful campground close to the beach, everything was friendly and quiet, and the landscape impressed with sweeping vistas across kilometers of sandy beach and the wild Tasman Sea. 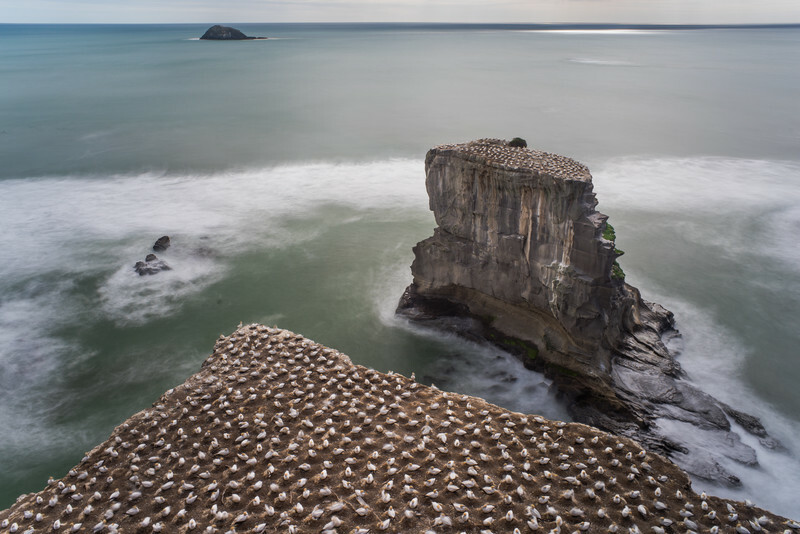 However, the main reason for our visit was the mainland gannet colony that is so easily accessible at Muriwai Beach. The paths in this beautiful park are well-organized and direct the birdwatchers, photographers and visitors to different viewing platforms that are just above the shrieking and stinking birds and the thunderous Tasman Sea. The composition shown here is one that I imagined long before we even came to Muriwai (New Zealand even). I am quite satisfied with the result, even though chromatic aberration was a problem here as well - as in the last print example. Actually, this is the first time that I cheat a little bit with my monthly print: Although I have printed this photographs already several times, the result is still not satisfactory. There is an annoying line of black spots that appear across the entire print and that I still have not managed to get rid of, but I keep trying and cleaning the printer.